The concierge at the elegant Beech Hill Country House Hotel is on hand to give us some expert advice for your trip to the walled city. 1. What restaurant would you suggest to get a really good introduction to local food? For the best introduction to local food I would recommend our own Ardmore restaurant within the hotel. We grow a lot of our produce right here in the walled garden and work alongside other local producers to serve traditional, comforting and tasty dishes. 2. Is there any etiquette around dining, tipping, and service that I should definitely know before eating out in Derry-Londonderry? Derry is a very convivial city and while tipping is not compulsory, it is greatly appreciated. Most restaurants do not include a service charge so the level of tip is at the diner's discretion. 3. I only have 24 hours in the city, what three things are must-sees? To fully appreciate the beauty of the city, the first thing to do in a short time frame would be a walk around the historic walls that are over 400 years old and encase the whole city. Try it at your leisure or on a tour. The next must-see is the city's Peace Bridge, a relatively recent addition to the town, connecting both sides of the River Foyle. Finally, don’t miss the city's main building – the Guildhall, sitting just outside the city. Dating from 1887, this beautiful building boasts stunning stained glass windows and of course the Guildhall Clock, which was modelled on London’s Big Ben. 4. Which are the city's nicest and most tranquil green spaces? St Columb’s Park, the city's main public area, is the perfect spot to bring along a picnic and relax, surrounded by trees and birdlife. A peaceful little haven in the city. 5. Is there a walking or cycling tour that you'd recommend? Beech Hill has its own 6km of multi-activity trails. Some of the trails follow the history of the marines based in Derry-Londonderry during the Second World War and showcase some of Ireland's native trees. 6. What are Derry-Londonderry’s hidden treasures, places the tourists don't normally see? Hidden away at the top of the city is Prehen Wood. It's a beautiful patch of woodland that visitors are largely unaware of. 7. What about authentic Irish crafts and design, where should I shop? Derry-Londonderry has its own Craft Village located right in the centre of the city, where local artists showcase their skills. A great opportunity to buy some traditional Irish crystal! 8. Which old traditional pubs will give me a real sense of Derry-Londonderry pub life? For the best Derry-Londonderry pub life check out Peadar O’Donnell's or the Guildhall Taphouse. You’ll be sure of a great pint of Guinness and friendly chat from the staff and locals alike. 9. If you had to recommend the best day trip out of the city, what would it be? Derry-Londonderry is convenient to attractions on both the north and south of the border. But one day trip I would definitely recommend is the Inishowen Scenic Drive which highlights some of Ireland's best landscapes. 10. 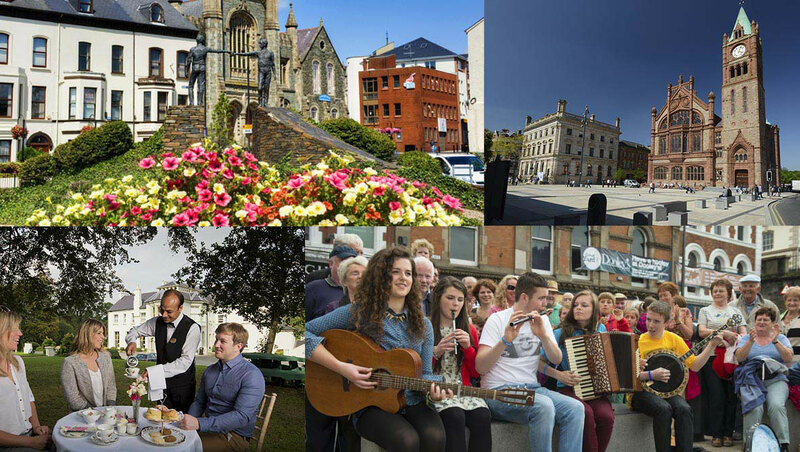 What is your own very favourite thing about Derry-Londonderry? The people. The people are the friendliest and most welcoming anyone will meet. It's something our guests at the hotel always comment on.